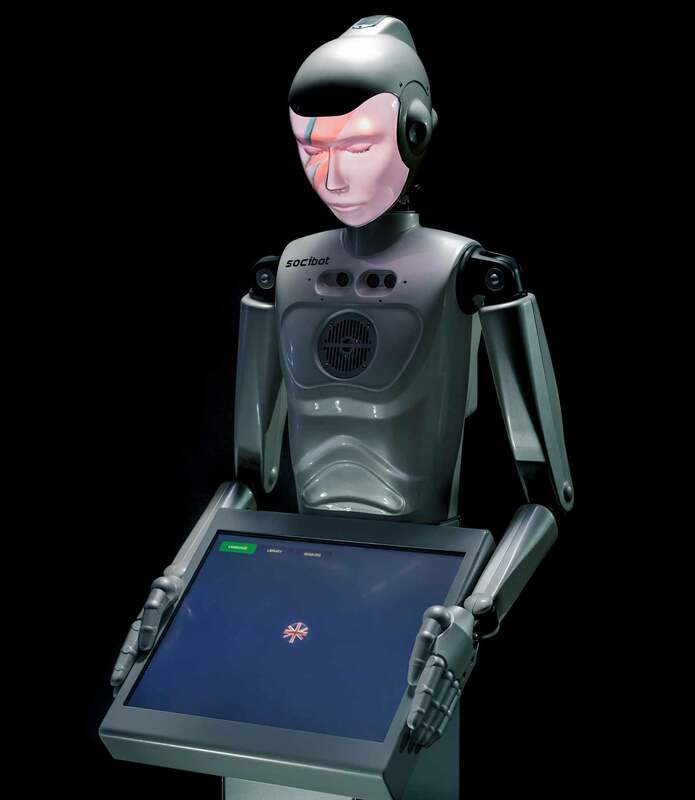 RoboThespian is a life sized humanoid robot designed for human interaction in a public environment. Fully interactive, multilingual, and user-friendly, it’s a perfect device to communicate and entertain. 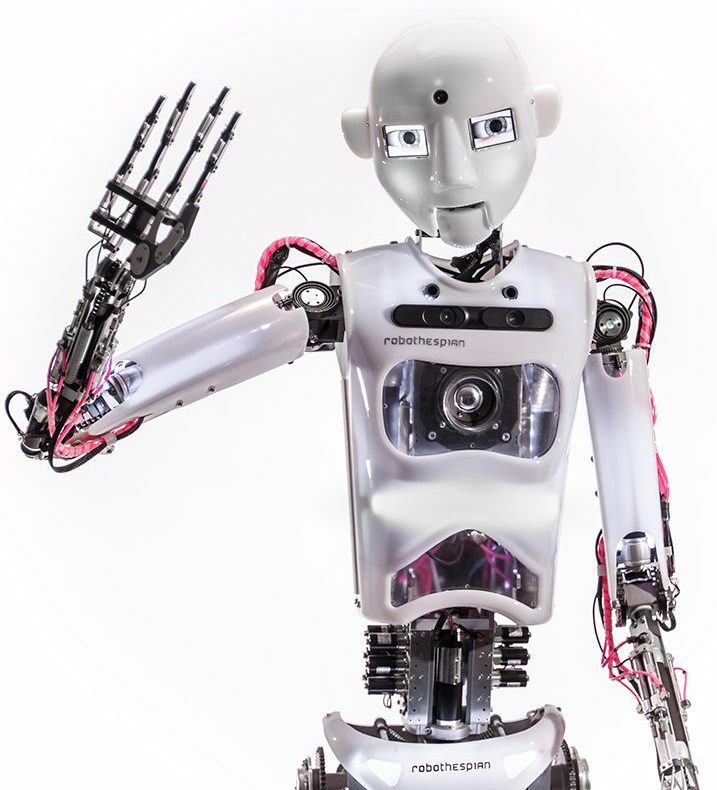 In its fourth generation, with more than ten years of continuous development, RoboThespian is a tried-and-tested platform, trusted by national science centres, visitor attractions, commercial users and academic research institutions around the world. Flexible, functional and expandable, RoboThespian can be adapted and customised to meet your needs. Modern life is defined by humanity’s love-hate relationship with its own technological creations. It’s in our nature to see life, personality and intention where none exists. RoboThespian™ exploits this desire; it is an anthropomorphic machine, a dot on the graph that starts with automata and will end when we are no longer able to distinguish the living from the mechanised. Combining the appeal of a sophisticated entertainment package with the capabilities of a versatile research platform, RoboThespian comes with standard content, like greetings and impressions. Whilst being easy to create and add bespoke content. With a web based interface files controlling movement, sound and video can be simply uploaded. RoboThespian was designed from the outset as a flexible communication medium. Engineered Arts can work with you to produce a robotic partner for your research, entertainment or communication needs. The eyes follow you around the room; the expression changes to reflect its mood (or yours!). SociBot can be a he, a she, or any character you care to invent. SociBot is a compact, sociable robot and is designed for human-robot interaction in a more intimate setting. Containing all the processing power of RoboThespian, compressed into a stand-alone kiosk or desktop device. The power of SociBot lies in its sociable qualities – the ability to detect faces, features, emotions, speech and gestures. It also makes use of projective technology coupled with facial generation via parametric meshes to bring any character or image to life, in full 3D form. With 40+ faces installed on your robot and the ability to add your own, SociBot is a truly versatile delivery system. If you like your robot’s a little less “roboty”. We are now creating beautiful, lifelike robots. From the outside, they look like animatronics. But on the inside, they are a whole lot different. 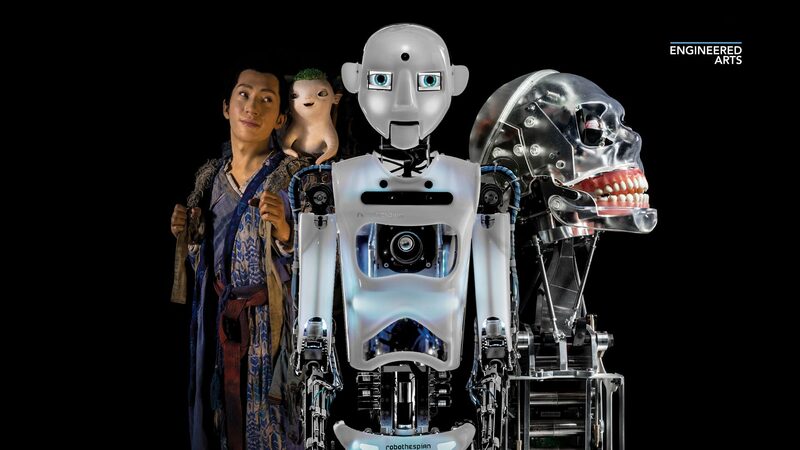 Featuring sensors and the extensive software framework developed for RoboThespian, Mesmer robots are the smartest animatronics on the market. 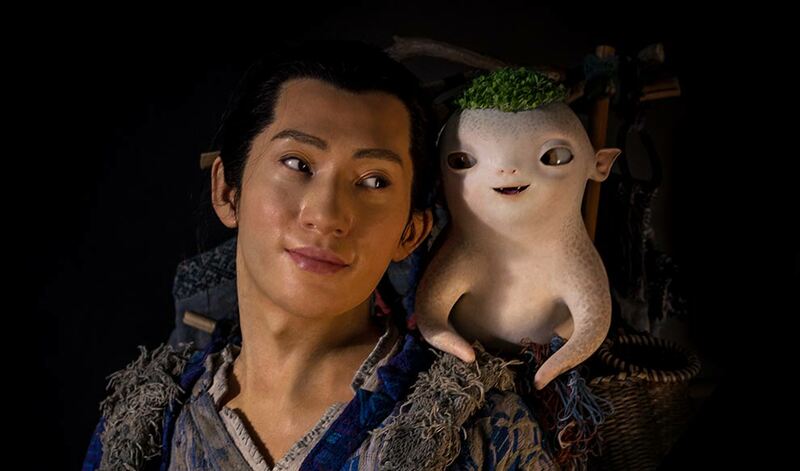 Allowing breathtaking interaction, that is just not possible with simple animatronics. Every motor and sensor is an internet connected device, meaning they can be controlled, reprogrammed, animated and maintained from anywhere in the world. They also use our market-leading animation software “Virtual Robot“, meaning anybody of any experience can drag around a 3d model in a browser, and transfer content at the click of a button. Characters can be fictional, or faithful recreations of real-world people. With accuracy to the last pore of finest of hairs. With bio-mechanical design our robots move very smoothly, quietly and naturally too. Additionally, we undertake custom commissions for a range of customers. Including multinational attractions, TV and animatronic companies. Experience gained from building the most captivating robots in the world feeds into our custom creations. Creating an efficient and effective process from design to delivery. The forms of our custom commissions vary from, realistic humanoids, scaled up robotic toys, to larger than life monsters. All to name a few. We have the facility, skill and experience to make your vision a reality. At Engineered Arts, we make the most memorable robotic experiences in the world. The unique combination of cutting edge technology and focus on public experiences means nothing in the world comes close to seeing one of our robots. Based in the UK, we have an extremely talented team of designers, engineers, artists and developers. All working together to produce hardware and software, that creates joy and entertainment in the most novel way. We use in-house manufacturing facilities to ensure rapid design, prototyping, testing and re-manufacturing. 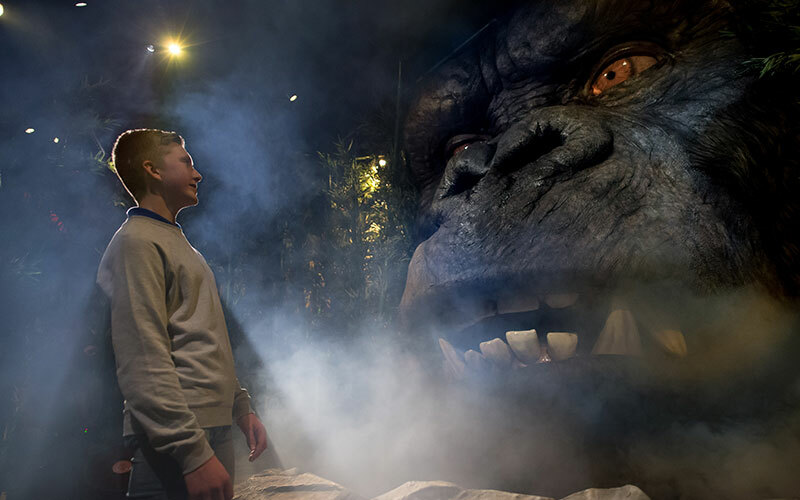 Our robots are often a sales and marketing tool, star attractions at large theme parks and visitor attractions as well as platforms for academic research. We are constantly developing our hardware and software, to ensure our robots are easy to use and hard to ignore.